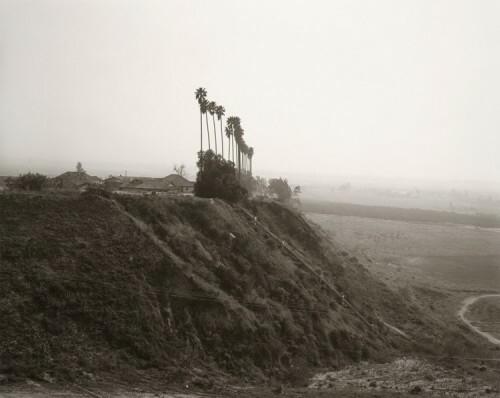 Robert Adams: The Place We Live Los Angeles County Museum of Art 5905 Wilshire Blvd., Los Angeles Through June 3 In his 45 years photographing the American West, Robert Adams has documented the evolution of landscape and our relationship to it. In response to the rapid development of his surroundings in Colorado Springs and Denver, Adams began photographing a landscape marked by tract housing, highways, and gas stations. His photographs, Adams says, “document a separation from ourselves, and in turn from the natural world that we professed to love.” Nearly 300 prints showcase Adams’ career, from his early shots of Colorado’s desolate terrain to his recent works documenting migrating birds in the Pacific Northwest, with special focus on his portrayal of the Los Angeles region. 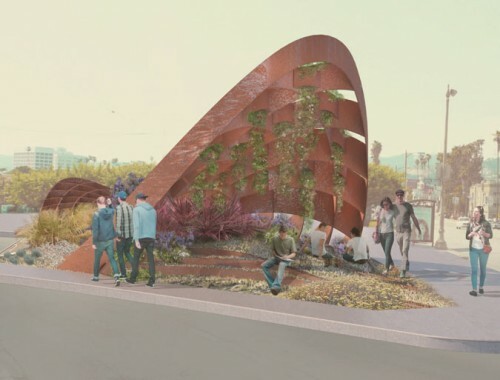 The building of a proposed neighborhood symbol on the corner of Sunset and Santa Monica Boulevards in Silver Lake has been pushed back due to lack of funds. After winning the Envisioning Silver Lake competition last summer, LA firm ALLTHATISSOLID (ATIS) has been working with the city's Bureau of Street Services (BSS) to scale back and refine the design, called "Bloomrs," to fit the $100,000 budget with room for curbing and other street improvements included. The saddle-shaped structure, made of Cor-ten steel, has already been re-designed to occupy a smaller footprint and rises to a shorter height. The funding hiccup seems to have its roots in the hazy project scope, presented during the competition. “Our budget allocated for everything that we designed, but it didn’t include street improvements and curbing and intersection reconfiguration,” said Heather McGinn, partner at ATIS, who further clarified that the original proposal was only $6,000 over the $100,000 budget, set aside from the state’s $1.5 million Metro Call for Projects program. ATIS and the bureau are now trying to secure additional funds, estimated around $50,000 to $70,000, said Robert Gutierrez, Streetscape Section Supervisor of BSS. Pending funding and design, the “saddle” should be ready by Spring 2013. Over the weekend, over 100,000 pedestrians and cyclists packed the streets of Los Angeles for the city's CicLAvia open streets initiative, a play off of the the Ciclovia in Bogotá, Columbia which popularized the movement to shut down city streets to cars and turn them over to the community for a day. But masses of people taking to the streets wasn't the big news out of LA. Mayor Antonio Villaraigosa made a surprise announcement that the city is the latest to join the bike share craze that's been pedaling across the nation. When it opens later this year, LA's bike share system will be among the largest in the country, so AN decided to take stock of where some of the biggest initiatives stand today. 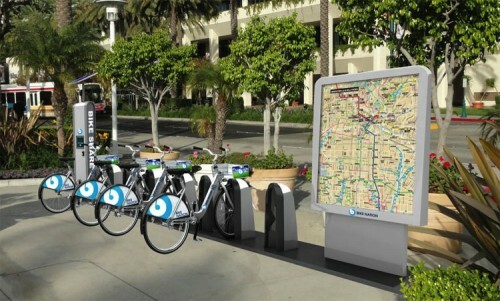 Los Angeles will be partnering with local bike share company Bike Nation to bring 4,000 bikes distributed over 400 stations throughout the city, marking a $16 million investment by the company. Bike sharing programs have been popular because of these public-private partnerships where the physical infrastructure is paid for by a private operator and funded by branding and member fees. According to StreetsBlog LA, the mayor said, "Angelenos are aching for a day without a car." He jokingly invoked the catch-phrase "Carmaheaven" describing the splendor of car-free streets created during last year's infamous Carmageddon. A previous attempt at initiating a bike share program failed in 2008 as many worried a flood of inexperienced cyclists would overwhelm the city, but times have changed. The city hopes to have the program installed in phases over the next couple years, with the first bikes hitting the streets as early as the end of the year. Farther north in California, a regional bike share system is taking shape in San Francisco and several Silicon Valley cities. 500 bike will be distributed throughout downtown San Francisco just before the opening of the America's Cup boat race. An additional 500 bikes will be located near transit stops in Redwood City, Mountain View, Palo Alto, and San Jose. StreetsBlog SF reports that the San Francisco Bicycle Coalition has set a goal of 20 percent of trips in the city on bike by 2020. On the east coast, New York's massive 10,000 bike strong system will be the largest in the country by far and is expected to open this July. The city has been presenting preliminary station maps to community boards after a public input process earlier this year and a finalized map is expected to be released soon. 600 stations are planned across Manhattan and Brooklyn. Excitement across the city has been growing as evidenced by a recent bike share exhibition at the Center for Architecture. In Chicago, many have been waiting to see if DOT Commissioner Gabe Klein can pull of another bike share success story like he did when he helped set up a Capital Bikeshare in Washington, DC. His newest program will launch this September, sprinkling some 3,000 bikes across 300 stations in the Windy City with another 2,000 bikes and 200 more stations in the following two years. Mobility in the city took one additional step forward last Friday as the Pedestrian and Traffic Safety Committee approved a contract with Alta Bike Share of Portland, Oregon to provide the thousands of new bikes. But not to be left out, that bike Mecca of American cities—Portland—is starting up its own bike share system as well. The city released an RFP for a bike operator in March and bids are due at the end of May. With an anticipated opening set for April 2013, expect to see even more bikes will be cruising the Rose City. Bike Portland noted that the city is hoping to use the bike stations as place-making devices to maximize their benefits. Citizens are currently being invited to propose bike station locations on an interactive map. Breaking Ground: Chinese American Architects in Los Angeles (1945–1980) The Chinese American Museum 425 North Los Angeles St., Los Angeles Through June 3 As part of the Pacific Standard Time initiative, the Chinese American Museum presents Breaking Ground to showcase the pioneering contributions made by four Southern California–based Chinese American architects. 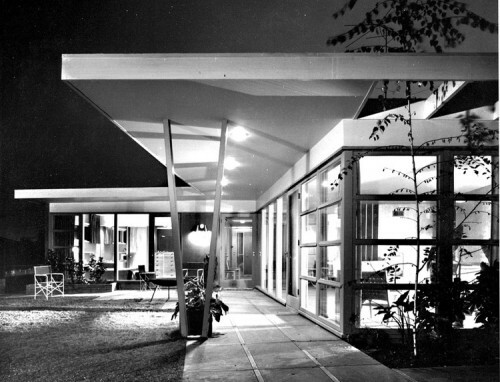 These architects, Eugene K. Choy, Gilbert Leong, Helen Liu Fong, and Gin Wong, all made contributions to the development of postwar California architecture, from Choy and Leong’s playful Chinatown Modernism to Wong’s radical masterplan for LAX and Fong’s development of the Googie style (think neon signage and cantilevered boomerang-shaped roofs). 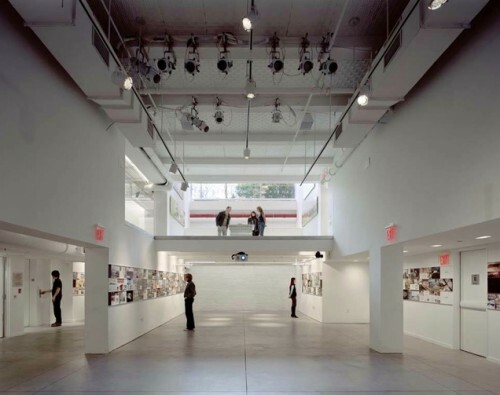 Original and reproduced photographs, blueprints, renderings, and drawings of works by the architects are on display, including original photographs by architectural photographer Julius Shulman (above, The Choy House). 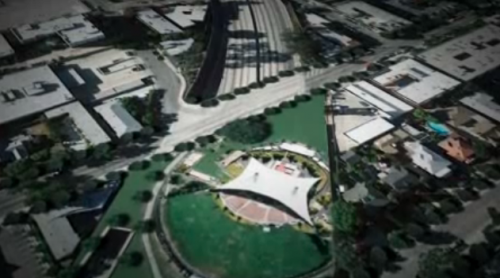 You'd better get used to it, Los Angeles is remaking itself from a one trick pony town where car is king into a multimodal city for pedestrians, cyclists, and transit users. The latest improvement is Sunset Triangle Plaza, the city's first pedestrian plaza created by a new collaboration called Streets for People (S4P) that hopes to churn out dozens new pedestrian-oriented spaces a year across the city. 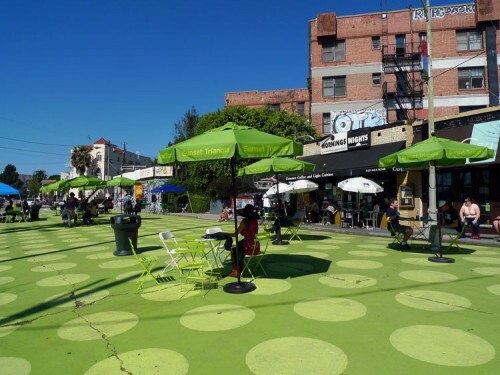 The green-on-green polka dot plaza officially opened this month to crowds of gleeful pedestrians in the hip enclave of Silver Lake, northwest of Downtown LA. 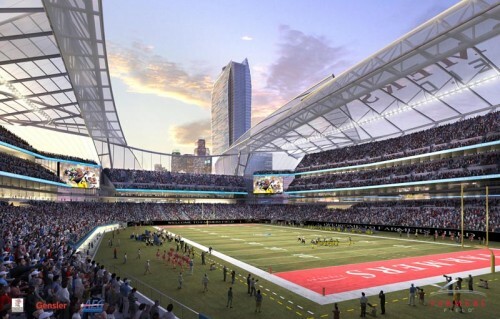 The year-long pilot project was designed by Rios Clementi Hale Studios, who said the design is open to interpretation. 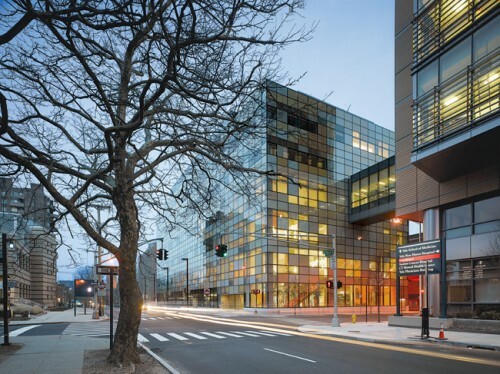 "The dots play off of D.O.T., the abbreviation for Department of Transportation, which is integral to the Streets for People program," said firm principal Frank Clementi in a statement. 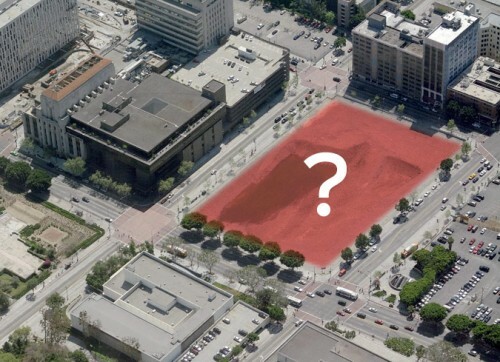 The 11,000 square foot plaza at Sunset Boulevard and Griffith Park connects the neighborhood to a small triangular pocket park previously stranded in a sea of streets and plays host to a twice-weekly farmers market. Moveable bistro tables and chairs, also in green, fill the plaza and large pots filled with drought resistant plants serve as bollards at its perimeter. Streets for People is an initiative of LA's Planning Commission and and the LA County Department of Public Health that hopes to reclaim underutilized street space in LA. "Using paint and planters allows us to recapture streets for people in months rather than decades, and for thousands—rather than millions—of dollars," said William Roschen, president of the LA Planning Commission, in a statement. "Now that we have the process, template, and cooperation of city departments and the community, we have several key variables in place to do upward of 40 projects a year." One of the things that fascinates and baffles me about l.a is the randomness and accidental beauty and strangeness of the architecture here. Every day I arbitrarily see buildings and houses and odd structures that go from the beautiful to the banal, usually within 10 feet of each other." The artist is especially interested in the secret nature of LA's best buildings. His most recent post documents a "moorish early 20th century quasi castle" in Hollywood. 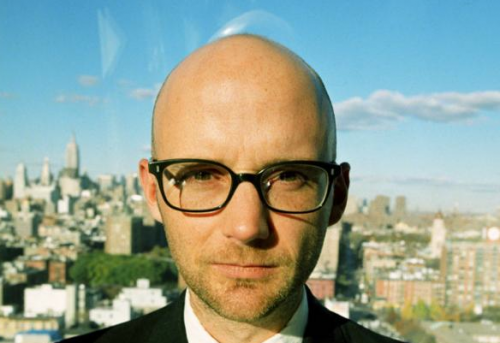 Says Moby: "Most cities are populated by remarkable architecture that’s pretty easy to find (chrysler building, st. peters, kremlin, big ben, etc). l.a is populated by about a million hidden gems. 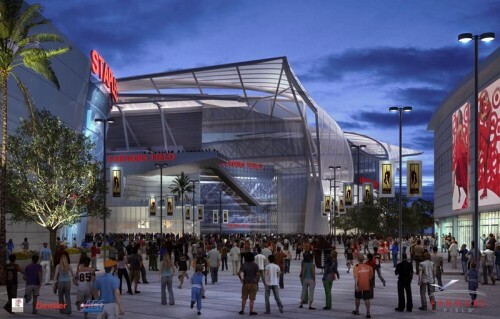 Read more at Moby Los Angeles Architecture. 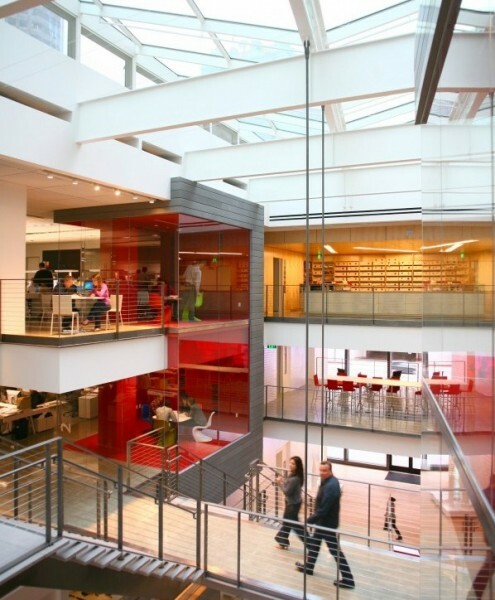 With all the news coming out of Gensler lately we've officially declared November Gensler Month. The latest is the firm's new offices inside the Jewel Box building in Downtown LA, a glassy former bank branch located between huge towers at City National Plaza. Completed in record time (construction didn't start until about March of this year) the project, headed by Gensler Associate Richard Hammond, feels like a miniature city with flexible, open banks of offices and small, colorful meeting spaces abutting the open atrium—created by cutting a 30 foot by 50 foot skylight in the ceiling—that defines the space and provides views throughout the interior and onto the city at large. The offices contain an unmistakeable energy collected from the whirl of activity and people and from the connection to the city. The firm, which moved in a week ago, has signed a 12 year lease and can sign two 5-year extensions, so it looks like they'll be here for a while. Just when we were getting used to Behnisch Architekten having an office in Venice we learn that leader Christof Jantzen is leaving and the office is closing. Stuttgart-based Behnisch opened the outpost back in 1999 and the location has worked on projects ranging from a lab at Yale, student housing at UC Berkeley, and an upcoming parking garage in Santa Monica. Now Behnisch's only U.S. office is in Boston. "It's an evolution," described Jantzen. "We had a successful story together." Here comes the good news: Jantzen is starting his own firm, Christof Jantzen Architecture, just down the street, and he hopes to take some of Behnisch's eight Los Angeles employees with him. Jantzen described the venture as on the "smaller scale" to begin but noted, "we'll see how it develops." The web site isn't yet live, but it will be www.cjantzen.com.